Cheese was usually delivered to the grocery store or meat market as a round block a little over a foot in diameter and several inches thick. The cheese was then sold to the customers as small wedges cut from the big block by a cheese cutter. The cutter consisted of a turntable upon which the cheese block was placed, where a heavy blade pivoted so that, when pressed down, it made a cut from the center of the cheese block to the edge and thus cut off a wedge-shaped piece of the cheese. 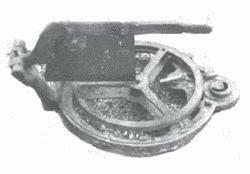 The wedge size was determined by how much the turntable was rotated between cuts. There were usually marks on the turntable to facilitate judging how many ounces a cut-off piece would weigh. OTHER FAMILIAR GADGETS that might possibly be new to you are include a cheese cutter for faceting, biscuit/cookie cutters and a pizza cutter for cutting out shapes on a moist slab of clay, and a sewing-pattern tracing tool for cutting and/ or adding texture. Too high and the wire would act like a cheese cutter and slice the ball in two. supplies of perishable foodstuffs divided into 13 lots: bread 2 zones, 2 zones pastries, butter, cheese cutter, cheese portions, UHT milk; dairy products, eggs, cheese cutting Bio, Bio dairy products; Organic egg. t w d During a three-day ordeal, he was beaten with table legs, had his feet ripped apart by a cheese cutter and his cheek was so severely slashed that it was hanging open. Cut the butter into 1/4-inch pats (a wire cheese cutter works well for this), and set the butter back in the refrigerator until used. The jury will assemble at Mold Crown Court this morning before being taken to see the field on the Erddig Estate, outside Wrexham, where prosecutors say Polish cheese cutter Lukasz Reszpondek buried Mrs Rodgers, known as Tati, after strangling her. A JURY deciding whether Polish cheese cutter Lukasz Reszpondek murdered Indonesian divorcee Ermatati Rodgers will tomorrow visit the shallow grave where her body was found 14 months after she disappeared. Polish cheese cutter Reszpondek, 30, denies murdering Mrs Rodgers at his home in Trinity Street in Rhostyllen in January 2008 but has admitted preventing her lawful burial. Other new additions include an improved platform cheese cutter with a serrated and straight blade, a table waste bin for small trash collection and a cone-shaped table cheese grater. 2)supply pneumatic cheese cutter complete with necessary heads to cut 200mm wheel cheese in diameter and 70mm in height.